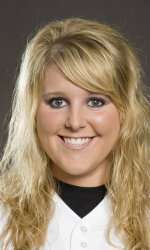 Missouri softball pitcher Chelsea Thomas, a redshirt sophomore, set the new school record for most strikeouts in a single season in the fourth inning of the second game against Western Illinois. Her 287th career strikeout moved her passed Erin Kalka, who struck out 286 batters during the 2004 season. Thomas finished with eight strikeouts in what turned out to be her 24th win of the year. The 8th ranked Missouri softball squad closed out the non-conference portion of their regular season with a sweep over the Leathernecks on Wednesday, taking game one by a 7-2 score before winning 5-0 in the finale. Missouri hosts No. 4 Texas this weekend with the Big 12 championship on the line. Game one begins on Saturday at 2 p.m. CT, with Sunday’s finale at Noon CT. Sunday’s game will air live nationally on ESPN and fans are encouraged to arrive early both days as attendance records could be set.